Out of the wreck of what was Christchurch, a new city is being planned. Kaituhituhi Howard Keene reports. Photographs: Giora Dan and supplied. Above: Rakiihia Tau Sr., Ūpoko o Ngāi Tūāhuriri. It may be a world first situation. In the wake of a devastating natural disaster, the local indigenous people are involved in the redesign and reconstruction of a city from the highest governance level right through to the actual physical reconstruction. Academics are calling it globally unique, the city’s mayor says it is the way it should be, and Te Rūnanga o Ngāi Tahu kaiwhakahaere Tā Mark Solomon says it is the best expression of the Treaty relationship he has ever seen. Thirteen years ago, Ngāi Tahu would not have been the partner of choice for the rebuild of Ōtautahi. But after its century-old Treaty of Waitangi claim was settled in 1999, the iwi made quick work of restoring its political, cultural, and economic influence. However, Christchurch remained visually and culturally dominated by English aesthetics and values. That was the situation until two-and-a-half years ago. Enter Rūamoko. On September 4, 2010, February 22, 2011, and many occasions afterwards, major earthquakes broke the back of the city and allowed the old wetlands to temporarily re-establish themselves, leaving swathes of land, especially in the east of the city, uninhabitable. It was a traumatic series of events causing death and extreme adversity. But out of the wreck of what was Christchurch, a new city is being planned, and the Government has given Ngāi Tahu a prominent role in that process. It is seen as a chance to build, more or less from scratch, a post-colonial city, inclusive of everyone; and a city with a strong recognition of the mana whenua of local hapū, Ngāi Tūāhuriri. “You don’t see much at all relating to the Māori heritage and history of Christchurch, but it’s huge,” says Te Rūnanga o Ngāi Tahu kaiwhakahaere Tā Mark Solomon, in his office high up in the control tower of the former Wigram Air Force base. In March, 2011 the Canterbury Earthquake Recovery Authority (CERA) was created as a Government department with extraordinary powers to develop and manage the recovery strategy. For the bodies that needed to be consulted, Ngāi Tahu was co-opted on equal footing with the Christchurch City Council, the Waimakariri and Selwyn district councils, and Environment Canterbury. Ngāi Tahu is part of the steering group for CERA’s recovery strategy and is leading the Iwi Māori Recovery Programme, which aims to ensure that recovery issues specific to Ngāi Tahu, ngā papatipu rūnanga and Māori in greater Christchurch are identified and implemented. Ngāi Tahu is also represented on CERA’s Recovery Strategy Advisory Committee and as Community Wellbeing planners; as well as being involved in the development of CERA’s Land Use Recovery Plan. Christchurch Mayor Bob Parker says this role for Ngāi Tahu is exactly how it should be. “I just see it as honouring the spirit of the land in which we all live. The rebuild has been described by Canterbury Employers’ Chamber of Commerce CEO Peter Townsend as the biggest economic development project ever in New Zealand “by a country mile”. As well as potential economic benefits, the rebuild is also a great opportunity for the tribe to reflect Ngāi Tahu histories and stories on an equal footing with colonial histories in the planned vibrant new city. He says the original blueprint for Christchurch was largely planned in England at a time of extreme marginalisation of Māori during early stages of colonisation. Under the Treaty settlement Ngāi Tahu’s partnership role in many areas has been acknowledged and acted upon, but Tā Mark is in no doubt the earthquakes sped up Ngāi Tahu’s rise to prominence in city affairs. “I was quite shocked when the CERA legislation came out that we were legislated into it. It was a positive shock, but I didn’t expect it. In the immediate aftermath of the February earthquake Te Rūnanga set up a sub-committee, Te Awheawhe Rū Whenua, which included the chairpersons of all four Canterbury rūnanga, to ensure that Ngāi Tahu led and responded to peoples’ needs at the time. That response phase lasted for about 18 months and the organisation is now focusing on recovery. Rakihia Tau Jr. was the general manager of Te Awheawhe Rū Whenua. He says Ngāi Tahu has some values it wants to see articulated in the city and its rebuild. But it is not just looking after individuals and communities where Ngāi Tahu has shown leadership. Many of the tribe’s wider, long-term aspirations have been taken on board in the blueprint for the reconstruction of the Christchurch CBD, released last year. The cultural aspects are especially important. Key priorities include putting some Ngāi Tahu names back on the Christchurch landscape, rejuvenating the Ōtākaro (Avon) River system, and recognising places of historic importance to Ngāi Tūāhuriri. “The concept of having the river planted from Hagley Park to the sea and showing what it was like really gels with us. That doesn’t mean we take out the exotics. I love our garden city, I love the trees, but it would be nice to see a stretch of it which is pure New Zealand native because it would be good for tourism and good for business,” Tā Mark says. Te Papa Ōtākaro, the Avon River precinct project, will be the first of the major projects outlined in the blueprint to get off the ground, and will strongly reflect Ngāi Tahu values. It is possibly the most exciting part of the plan from a Ngāi Tahu viewpoint, with a strong recognition of historic use of the area by Ngāi Tūāhuriri. The concept of continuous parkland from the source of the river to the sea was one of the strong themes that emerged from the Christchurch City Council’s Share an Idea scheme in 2011, in which thousands of residents put forward their aspirations for the new city. 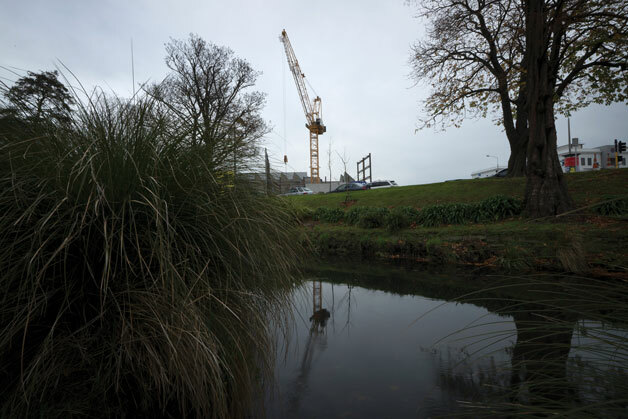 What emerged was a park zoning about 30 metres wide on both sides of the river, extending from Christchurch Hospital to about Fitzgerald Avenue in the east. Victoria Square – formerly Market Square, an important early trading point between Ngāi Tahu and settlers – will be a focal point, which the Council describes as “part of the central city’s spiritual and aesthetic identity”. Expect cafes, hotels, cycle and walking tracks, and native vegetation; but also expect a significant visual expression of Ngāi Tahu values in the precinct. Elizabeth Cunningham says the river is the magic for her. “I think about my nannies and the people prior to my nannies that used that river for so many reasons. Christchurch architect Perry Royal (Ngāi Tahu, Ngāti Raukawa), working in a private capacity, is part of the consortium drawing up plans for the river precinct. Royal believes the unusual geometry of where the river meets the grid of the city is the nicest part of Christchurch. Mahinga kai will be emphasised, as will places of significance like wāhi tapu and their connections. “Mahinga kai is a tricky one because a lot of peoples’ perception is that it’s almost like a national park where you ring fence it. 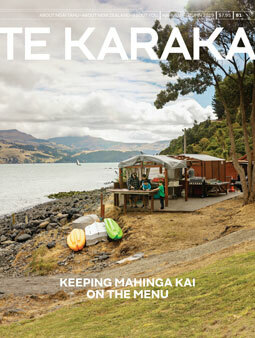 But for Māori it’s different; it’s about actually engaging with the environment and actually using it. “To find a sustainable level where humans are part of the mix is a tricky one, especially in an urban sense.” Perry says most Christchurch people are receptive to change at the moment because of what they’ve been through. “Ngāi Tahu’s no different. One of the really sweet things about this is Ngāi Tahu’s position in relation to this particular land has made sense to a lot of people who aren’t Ngāi Tahu, but just Christchurch people who love the place. It’s home; it’s ratified their affiliation or love of the place where they live. One strong idea that emerged through Te Awheawhe Rū Whenua was for a cultural centre, to be called Te Puna Ahurea, in Victoria Square, forming a symbolic waharoa or entranceway to the new city. It was included in the blueprint, but it is still early days for this project. Te Puna Ahurea’s development would be led by Ngāi Tahu, and would further cement the mana whenua of Ngāi Tūāhuriri and Ngāi Tahu in a city that until relatively recently was virtually blind to their presence. “There is nothing in concrete, no concept plan has been brought to the tribal council, so it’s a concept as it stands, but of course it will be looked at,” says Tā Mark. “Personally I’d like to see a cultural centre for all peoples. Names in the landscape are a powerful representation of a people’s presence, and it is likely more Ngāi Tahu names will appear in the new city, perhaps even in street names. However, judging from some letters to The Press when the blueprint was announced, there are some people who resent a greater Ngāi Tahu presence in the city. Cunningham says people should not be afraid. “I look at my son’s age group. They don’t seem to be afraid of saying Māori words. They don’t seem to be afraid of doing the haka. As one of the biggest property developing companies in the South Island, Ngāi Tahu Property will no doubt have strong involvement in the rebuild, leading some to raise the issue of conflict of interest. The rebuild of Christchurch and Ngāi Tahu’s role in it is an aspirational story for many people reflecting on the past and the future. Ngāi Tahu is also looking to invest in other centres in Te Waipounamu. Tā Mark Solomon went to Ōtepoti (Dunedin) late last year to meet the mayor and local rūnanga, to look at opportunities for investment in Otago. “I think the only investments we’ve done in Dunedin, the second city of the South Island, are that we own the police station and we’re part of the Ryman Healthcare facility down there. “We do need to look at the other regions for investment. We need to balance everything we do. The fact that we had a major earthquake here – it doesn’t make sense to have all our assets, our buildings here in one centre. Te Rūnanga o Ōtākau chairman Edward Ellison says the bulk of Ngāi Tahu investment going to Christchurch has been an ongoing issue for outlying rūnanga, particularly Ōtākau. “We’ve been raising it at the table and elsewhere, and are keen to see some of the asset that’s been built up applied in the regions, and see some empowerment.